Why Your Dog Needs Bullyade? 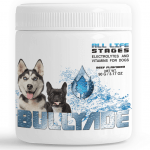 Bullyade Rehydrates & Gives your dog all the vitamins they need. Your dog does not get everything they need from food! And Bullyade helps to add the much-needed nutrients your dog needs daily. This is a question we often get and we want to clear the air about why you should be using this fantastic product. First of all, it doesn’t matter what type or breed of dog you have. Our product is great for all dog breeds. Also, bullyade can be a life-saving aid or a competition optimizer. The single most important fact is, dogs dehydrate faster than anything on the planet. Have you ever seen a little dog with its tongue hanging out of its mouth, panting feverishly? Bullyade can be poured right over your dog’s food also to give your dog back the nutrients they need on a daily basis. Bullyade Can Help Your Sick or Dehydrated Dog! The way Bullyade was developed was as a parvo treatment for sick dogs stricken with the parvovirus. We then soon realized, our product is great for many other situations. Bullyade Can Help your pet in loads of different ways. Packed Full of Electrolytes for dogs and Vitamins, Bullyade helps your pet recover fast on days that can range from just a normal walk out on a hot evening to emergency situation where your pet may be suffering from Coccidia, Parvo in dogs, any dog with diarrhea, or any dog dehydration issues. 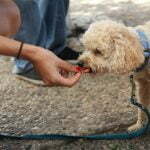 Bullyade Also Changes the flavor of your pet’s water to Beef or Chicken; a flavor they just can’t resist. Just know this, electrolytes and vitamins on a hot summer day is not a want, its a need. Working dogs, competition dogs, military dogs, police dogs, sled dogs, sports dogs, dock diving and even sick dogs needs Bullyade. It’s specifically designed for them. Call us at 1-866-451-4802 if you have ANY QUESTIONS.